Watch the best of the action from the FA Cup win. Watch our quickfire highlights from the FA Cup win over Watford. Pellegrino: We're getting closer to our "real level"
Manager sees progress in improving Saints. Relive Saturday's FA Cup win in pictures. Watch the manager's reaction to the win over Watford. Manager left with two reasons to be cheerful after cup progress. Defender scores first goal for the club to secure cup progress. Saints finalise preparations for Watford cup tie. Get the thoughts from the Watford camp ahead of our FA Cup tie. Get the thoughts from the Watford camp ahead our FA Cup tie. Saints boss looks ahead to clash with Watford. Watch the boss preview the FA Cup fourth-round tie. The hard work continues at Staplewood as Saturday's FA Cup tie nears. The hard work continues at Staplewood as Saturday's Watford clash nears. Watch Mauricio Pellegrino's pre-Watford press conference. Can you get all 20 questions right? Get the lowdown on the Hornets ahead of the FA Cup game. 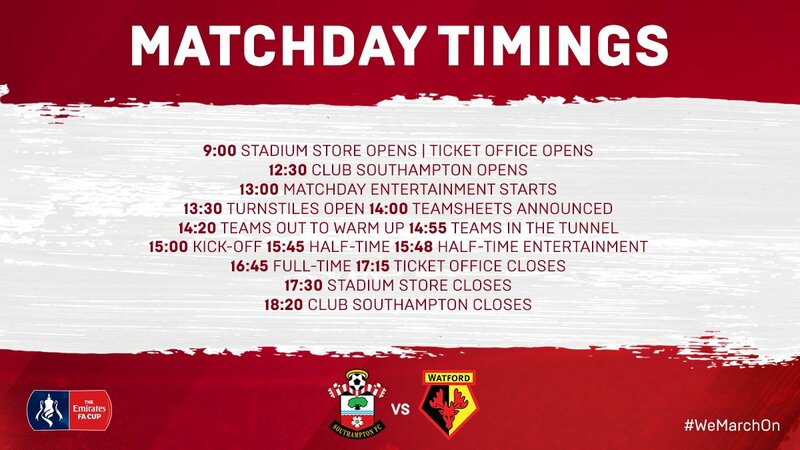 A break down of the facts as Saints prepare for their latest FA Cup clash. YES! 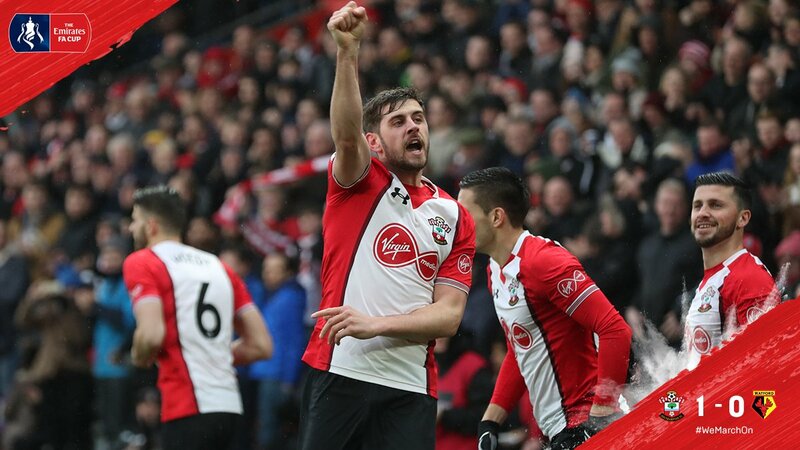 Jack Stephens' goal has put us in the Fifth Round of the FA Cup! 3️⃣ minutes of added time! It's Guido time! Our new number 9 is ON for his Saints debut. Dušan the man replaced. Sinclair on for Janmaat as Watford push for an equaliser. 24 minutes to play at St Mary's... here comes Maya for Sofiane. Cédric follows the Watford midfielder into the book for a hefty challenge on Richarlison. Watson is cautioned for a foul on Tadić. Second sub for the away side as Pereyra comes on for Carrillo. A fabulous pass from Tadić rips the Watford defence in half. Long is there to meet it but the striker makes a mess of an attempted chip and the visitors clear their lines. Big chance. More good stuff from Saints. Davis plays Long in behind and the number 7 drills a low shot into the arms of the Greek goalkeeper. Tadić is first on the scene - not for the first time today - to collect a loose ball in the Watford box. His cute through pass finds Long whose chip is saved by the sprawling Karnezis. The flag was up for offside regardless. Great play from the Moroccan brings the home crowd to its feet. Sofiane darts back to dispossess Okaka, gets his head up and swing a pass wide to Davis from the centre circle. An attacking change from Javi Gracia: the Spaniard brings on striker Stefano Okaka for midfielder Etienne Capoue. 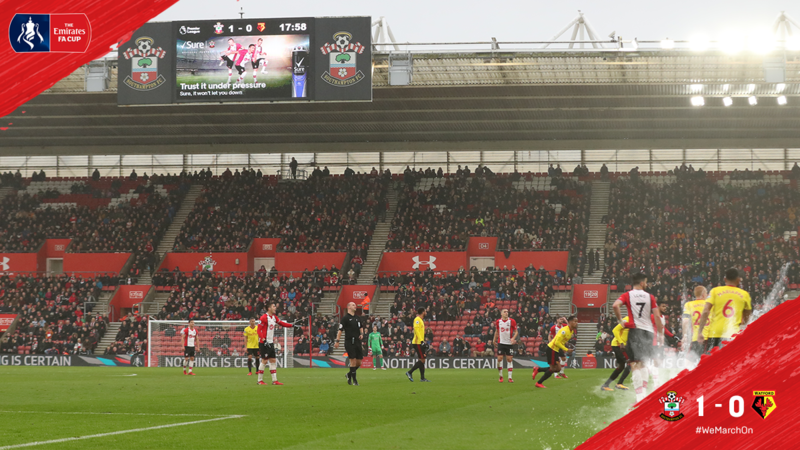 Back underway at St Mary's! Will Jack's goal send us through to the FA Cup Fifth Round? 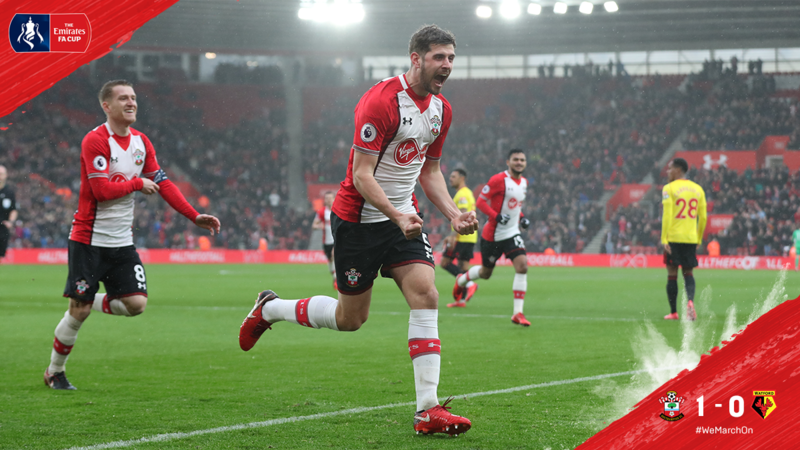 Here are the best of the images from our club photographer, who was on hand to capture all the key moments from a frantic first period at St Mary's. So far, so good! Jack Stephens' close-range after some sloppy goalkeeping from Watford's Orestis Karnezis' is the difference at St Mary's. Saints have been positive from the off and fully deserve their lead. Almost the spectacular equaliser for Watford; Richarlison attempts to chip McCarthy from distance but the Englishman is equal to it, tipping over the bar. Confirmation of that switch as Pied replaces Bertrand. An unforced change is imminent for Saints as Ryan Bertrand gingerly walks off the field after going to ground in his own half. Jérémy Pied will take his place. Boufal - one of the best players on the field at the moment - breezes past Janmaat once more and his scooped past finds Long who just can't the ball out of his feet quick enough to shoot. Wesley Hoedt lines up a free-kick after a foul on Højbjerg but the result doesn't match the expectation as the defender's effort bounces away off the Watford defensive wall. A rare foray forward for the Hornets ends as Ben Watson slices wildly wide from distance. Alex McCarthy untroubled. More good stuff here from Saints. Quick feet from Tadić makes space for a cross and the Serbian's delivery is headed over the bar by Long. Not a lot to report here since Jack Stephens' opener. The defender's first goal for the club has put Saints firmly in charge for now. Superb running from Shane Long almost creates a second! The Irishman scampers onto Dušan Tadić's ball over the top to cross for Cédric who just misses out at the back post. What a start! The resulting free-kick causes chaos in the Watford box and birthday boy JACK STEPHENS pokes in from close range to give us the lead! The home side get right on the front foot early on here at St Mary's as Sofiane Boufal ghosts past Daryl Janmaat and is pulled back to earn his side a free-kick wide on the left. Away we go at St Mary's! COME ON, SAINTS! Warm-ups are well under way here at St Mary's with just 15 minutes to go before kick-off. @SouthamptonFC Strong side, in it to win it. So, no place in the XI for Guido Carrillo but we may yet see the Argentinian at some point this afternoon. A trio of changes made by Mauricio Pellegrino here as Shane Long, Sofiane Boufal and Steven Davis come in for Manolo Gabbiadini, Mario Lemina and James Ward-Prowse. XI: Karnezis; Janmaat, Mariappa, Kabasele, Holebas; Watson, Doucoure, Capoue; Carrillo, Richarlison, Gray. SUBS: Bachmann, Prodl, Zeegelaar, Pereyra, Success, Sinclair, Okaka. XI: McCarthy; Cédric, Stephens, Hoedt, Bertrand; Højbjerg, Romeu; Tadić, Davis (c), Boufal; Long. SUBS: Forster, Yoshida, Carrillo, Ward-Prowse, Lemina, Gabbiadini, Pied. 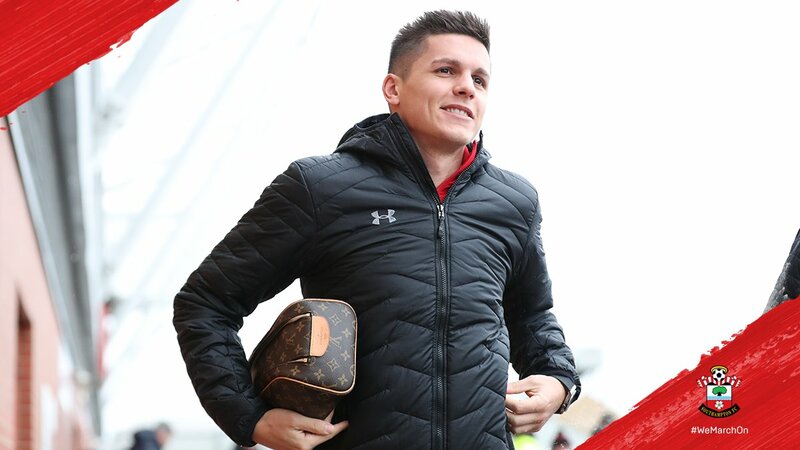 Will we be seeing Guido Carrillo in a Southampton shirt for the first time today? We'll be finding out very soon with breaking team news from 2pm! At St Mary's? Pick up today's edition of SAINTS! Jan Bednarek is our feature interview in Saints magazine today. After starring in the third round win at Fulham, the Polish defender discusses his football upbringing and how he’s settled into life in England, on and off the pitch. Elsewhere in the 68-page edition, Brett Ormerod relives a famous cup win over Watford from his playing days as the ex-Saint remembers the 2003 semi-final at Villa Park. The Southampton squad are here at St Mary's in focused mood ahead of today's game. We were on hand to capture their arrivals and Guido Carrillo's first look at his new home. Mauricio Pellegrino will be lining up alongside a new face in the Watford dugout this afternoon. Javi Gracia will take the reins for the first time today after taking the place of Marco Silva during the week. The former Rubin Kazan boss has signed an 18-month deal with the Hornets. WE want to move another round and we've got this 90 minutes as a possibility. it could be 90 minutes, it could be 180 but we have to think about our first step and to be focused on ourselves. Saints' FA Cup journey began at Watford three weeks ago, James Ward-Prowse netting the only goal of the game to knock out Fulham at Craven Cottage. The midfielder went on to net a double against today's visitors Watford the following week. The Hornets eased past Bristol City in Round Three. Good morning, Saints fans! The Emirates FA Cup is back at St Mary's today; Watford the Fourth-Round visitors this afternoon. Stay with us for all the build-up, team news, live match updates and free audio commentary from the 3pm kick-off. Up for the cup?